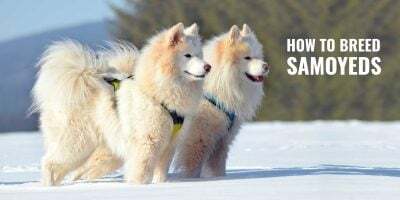 Hybrid Dog Breeds: What Does F1, F2, F3, F1b & F2b Mean? 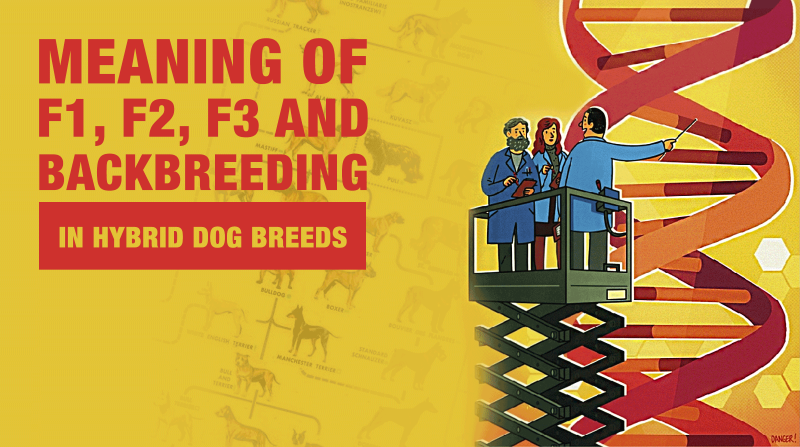 Crossbred dogs and designer dogs are often referred to as F1, F2, or F3, or even F1b or F2b. Example: a Labrador, a Poodle, etc. Example: a Labradoodle whose mother is a purebred Labrador and father a purebred Poodle. 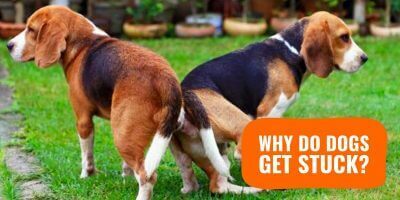 These are F1 backcrossed dogs. They result from the mating of an F1 parent and a P parent. This is used to intensify traits found in the P parent’s breed. Example: a Labradoodle whose mother is a Labradoodle and father a Poodle. F2 dogs are the offsets resulting from the mating of two F1 hybrids. Example: a Labradoodle whose mother is a Labradoodle F1 and father a Labradoodle F1. Example: a Labradoodle whose mother is a Labradoodle F1 and father a Labradoodle F1b. Example: a Labradoodle whose mother is a Labradoodle F2 and father a Labradoodle F2. An F3 or higher-generation hybrid dog crossed with an F3 or higher-generation hybrid dog. This is a more generic nomenclature and is mostly expressed using the generation of each parent, such as F4 Labradoodle x F2 Cockapoo. Example: a Labradoodle whose mother is a Labradoodle F3 and father a Labradoodle F5. what is the definition of two F1b’s mating? Is it desirable? An F1b x F1b breeding is a multi-generation and thus has to be precised since multi-gen is vague in itself. what would 2 F1B golden doodles produce? Mother and father both F1B golden doodles. If I breed and F1b and F2b together what would the puppies look like and what would you call them. These would be multi-generation dogs. I have a Cockapoo F1B (mother F1 Cockapoo and father pedigree poodle): I want to bred her with a pedigree cocker spaniel so the pups will have a stronger spaniel gene, but what would the pups be classified as? Cockapoo “F2”? I want to breed my Miniature F1b Goldendoodle with with a pure breed Miniature Poodle. What woul the puppies be called? Still an F1b since you breed back with a purebred. Please can you tell me what the puppies of f3b labradoodle crossed with poodle will be? A F3b since it is backbred again with a purebred poodle. I have F2 puppies- goldendoodles, they are beautiful! 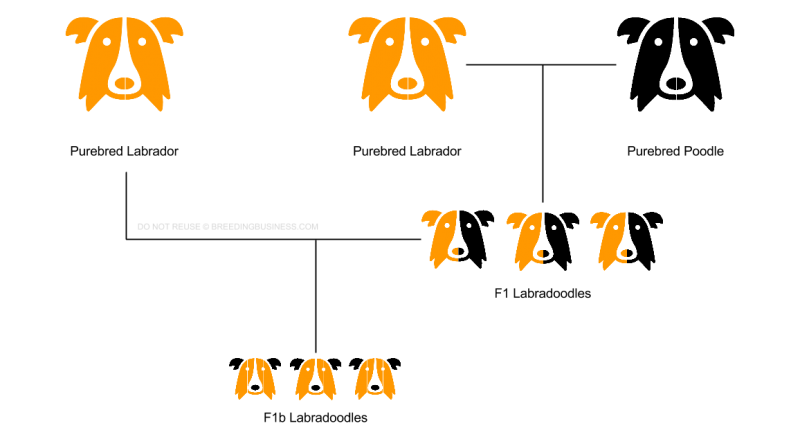 When you enter F2 another article comes up showing a golden retriever, all the F2 doodles I’ve seen look like golden doodles f1s, why the golden retriever pic in place of the F2S, I’m guessing they are promoting their F2 bs as they are evening down playing the f1 golden doodles, your thoughts on this? Hard to say without knowing the other article’s writer’s intent and knowledge. But because these nomenclatures are exactly for dogs who are not purebred (ie. not in a registry), it’s very easy after F1 to just make stuff up to suit one’s needs. Some ads i have seen for puppies have an “M” classification rather than the “F”. Is that the same thing or does it mean something else? If you have an f3 labradoodle , but you mate back to a Labrador , would that make puppies f2 a? That would be a multi-generation puppy. I have an F1b labradoodle and mating her with an F1bb labradoodle. Would this produce a curly coat in the puppies and would it make the pups an f2 or f3. My girl is very curly so didnt want to breed her back to a pedigree poodle.thanks ? I have an f1 mini goldendoodle male and a f2 mini goldendoodle that had a litter of puppies. So what are the puppies? This is an instance of a multi-generation litter of puppies. What generation would the puppies be of a F2 labradoodle with a pure bred poodle? I can’t see any examples of this. 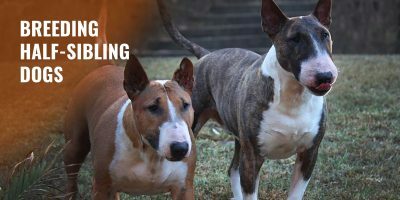 When hybrids are purchased from a breeder are papers issued stating their blood line? And are they registered anywhere? 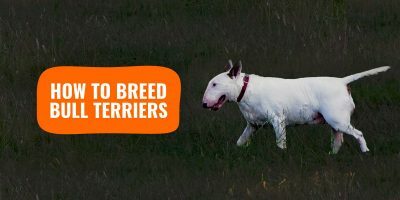 Hybrids rarely have papers since they are not purebred dogs. They may be registered with special/new registries, though, so it’s indeed possible but rare. The bloodline is just the affix of the kennel in most situations. 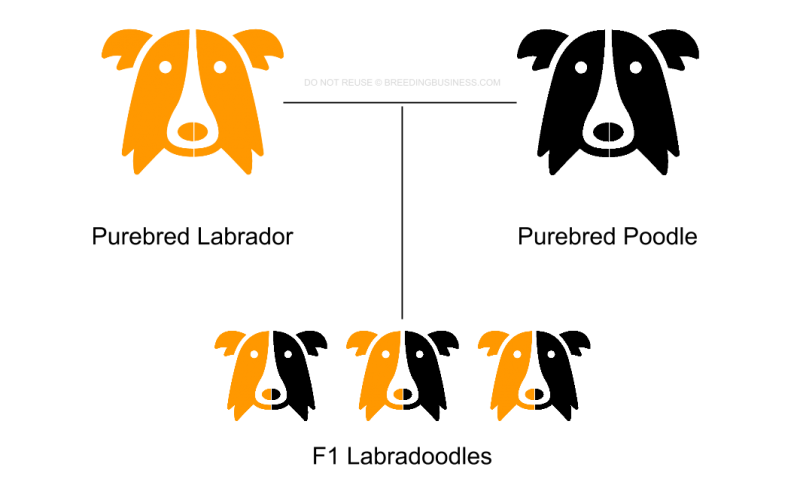 I have a (F2) golden doodle male and I’m breeding him to a female (P)standard poodle. I do not see a classification on the chart above for what the puppies will be. hello, i am expecting a new goldendoodle puppy and the parents are english petite multigen and f1b, what will the puppies be? Hello. I have a cavaschon with her papers, I didn’t register her, cuz I got her by default, owner couldn’t give her enough attention due to ending up having to go through chemo) she is 1&1/2 yrs old and I absolutely love her. I had no intentions of breeding her, since technically she’s a hibred to begin with, if I where to breed her, which pair would produce the heathies puppy? Bichon Frises or Cavalier King Charles Spaniels or another cavaschon? Question: Does it make any difference whether a dog/puppy is F1, F2 or multigenerational? Is it better to have F1? Will the temperament be any different, or the general health? So confused! Example breed a poodle and a Golden: F1 is the only way to know you have a 50/50 mix. Anything else can theoretically be a combination of 100% to 0% poodle to 100% to 0% Golden mix. Example 60/40, 40/60, 99/1, 2/98, etc. Another example, a scientist breed poodles and wolves. The F1 were a perfect mix of poodle and wolf (and bizarre looking). But when he breed the F1 to the F1, some of the puppies looked like wolves, some looked like poodles, some looked like a mix. But that is just the phenotype genes (the genes that express what we ‘see’). Underneath, the genotype, the puppies that look poodle could still be 40% or more wolf. In aggression, brain function, immune system, etc. And vice versa, the wolf looking puppies could be genotypically more poodle than wolf. But then the wolf looking puppies could be 80% wolf just like they look. You can’t know. Only the F1 is 50/50. Everything else is a crap shoot. Andrea I came to this page wanting to find the answer to the same question you have. Someone Please???? When you breed two full breed dogs, you always get 50% of both. Think of it as each parent is represented by 100 marbles (it’s not that simple but is just an example). Let’s say the lab is red marbles and the poodle is blue marbles. All the F1 puppies will get 50 “marbles” from each parent to equal 100 (50 red and 50 blue). Now for our example, when you put all those 50 red marbles and 50 blue marbles in a jar, theoretically, when you breed the F1 with another F1, you can get anything from a pure lab to a pure poodle. Because each F1 is made up of 50 red marbles and 50 blue marbles, the F1 gives 50% of it’s genetics to the F2. That means, theoretically, ALL 50 marbles could be blue or ALL 50 marbles could be red. But usually you get a mix of red marbles and blue marbles. The best way to imagine it is to reach blind folded into a jar of 50 red marbles and 50 blue marbles and take out 50 marbles. Then do it again with another jar of 50 red and 50 blue marbles. What are your 100 marbles? You might have 75 red and 25 blue. You might have 48 red and 52 blue. You might have 1 red and 99 blue. What is the offspring when an F1B labradoodle is bred with full blooded chocolate lab. I have a F1B Golden doodle black and white in color. He was produced by breeding a pure bred poodle with a F! Golden doodle. We would like to find someone with a female F1 Golden doodle. Since our dog would be theoretically 75 % poodle and 25% golden , what percentage of golden and poodle would the puppies be?